Something that has been playing on my mind lately is accepting people for who they are. I have quite a few friends who face unfair discrimination due to their race, appearance or interests and for some reason it's really come to my attention how much I hate the ease with which some people judge others. 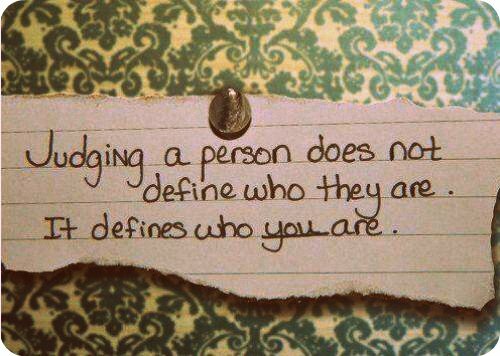 For some reason I really notice when people pass judgement on others, and it makes me sad because I don't see the point in it. People are unique, and that's what makes them interesting! It doesn't matter to me how someone dresses, what colour their hair is, whether they are fat, thin, short, tall, Asian, African, Arab, Buddhist, Muslim.....they are all still people and deserve equal opportunities in life. I have recently made a new friend who many people would consider to be 'different' from the norm, but I don't care what other people say about him. I think he's interesting and fun to be around, and I think that my impression and thoughts of him that have been formulated from the time I've spent with him are what counts. And also, who is to say what's 'normal' and what's not? Plus, where's the fun in conforming to societal norms and expectations? Conformity is overrated and boring. Funnily enough, the trigger for this post was watching The Rocky Horror Picture Show, which seems to preach that we should embrace our weirdness and accept the weirdness of others! It avoids resentment and dissension. Nobody enjoys being told what to do or how to be. It brings closeness. When people know that you accept them for who they are, trust develops. You experience greater personal growth. When you accept others, your focus changes from them to you which enables you to focus on fostering your own skills and improving your shortcomings. It enables you to let go of control and enjoy the many rewards that occur when you do. You have more peace and serenity in your life. Plus, who wants to be around someone that is always critical of others? Personally, I'm endeavoring to improve myself in this area because, while I think I'm pretty good at not being discriminatory, I still do it at times. I'm trying to see every new person that I meet as a potential friend. Yeah I notice it a lot too, and its really annoys me. Awesome to hear that you've decided to not let others get you down! I wish everyone could just except people for who they are, as cheesy as that sounds.